Hard to believe it has been two years since Baby crossed the bridge. I miss you Baby girl. 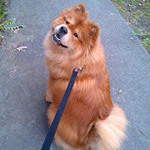 I know how you feel: There's a piece of my heart that will always miss Nikki and Oneil too.. At least you have Cocoa and she seems like she is a great chow to help you along and make new memories with her. But I totally get it, the missing part.. Thanks Nancy. 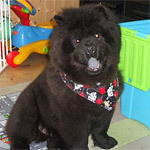 Yes, Cocoa is definitely a wonderful girl and she is by far the silliest chow I've ever met, she's a real clown. I don't think the missing part ever goes away, I still miss Buddy and Shadow too and they have been gone for years. Maybe a higher order decided you needed a chuckle and sent you Cocoa to get you through the rough days. I say if you don't miss them they were never true members of your family. You can't miss something if you never loved it. My thoughts are with you at this time in remembering Baby. People sometimes say they know how you feel, but they really don’t. I do know how you feel. I lost my beloved Chloe over 2 ½ years ago. They may be gone from us physically but they will always hold a special place in our heart and in the memory box in our minds. There are times when Chloe comes to my mind and there is an ache in my heart and tears come to my eyes or I chuckle to myself when a funny or fond memory comes to mind. I’m so glad you have Cocoa and that she is such a clown! I rescued Whitby last December. The difference between Chloe and Whitby is like night and day. Chloe was very gentle and part of my second skin. Whitby, unfortunately (hehe) has read the Chow handbook cover to cover and highlighted and underlined the pages. Almost every day we have a new adventure or we have a meeting of the minds. She’s my Pepsi challenge and makes life interesting. Sending you a warm comforting hug. Enjoy Cocoa She is a beautiful pup! Thanks Rio and Pam, and yes Cocoa certainly manages to make me laugh every day.